Soneva Fushi is one of the most breathtakingly beautiful islands in the Maldives. This 5 Star Maldives resort is the original desert island hideaway located in the Baa Atoll in the Maldives. Soneva Fushi is one of the largest islands in the Maldives and offers guests stunning white sandy beaches and mesmerizing ocean views. The resort is nestled in a turquoise lagoon and stretches 1,400 metres north to south and 400 metres wide. Offering 5 star luxury and a wide range of amenities this Maldives resort provides 5 star service including your own personal butler. The Mr./Ms. Friday butlers know what you want before you want it. The amenities are endless and children will enjoy the resort just as much as the adults. Children will enjoy cycling round the island, never knowing when you might have to swerve to avoid bunny rabbits or lizard. The kids can curl up and watch a movie in Cinema Paradiso or count Saturn’s rings in the Observatory. There is so much for the whole family to enjoy and Soneva Fushi truly is a family-friendly resort in the Maldives. Guests can enjoy the world renowned Six Senses Spa at Soneva Fushi. The spa offers relaxation and rejuvenation with its large reflecting pond and waterfalls, setting the tone for soul therapy. The spa menus offers a wide range of holistic and traditional treatments conducted by highly skilled therapists using all natural products. Spa programmes are complimented by a complete gym, beachside treatment villas and a Yoga Pavilion for wellness therapies such as yoga and Tai Chi. There is a wonderful selection of dining options at Soneva Fushi, you can enjoy beach side dining to fine dining in one of the many restaurants. 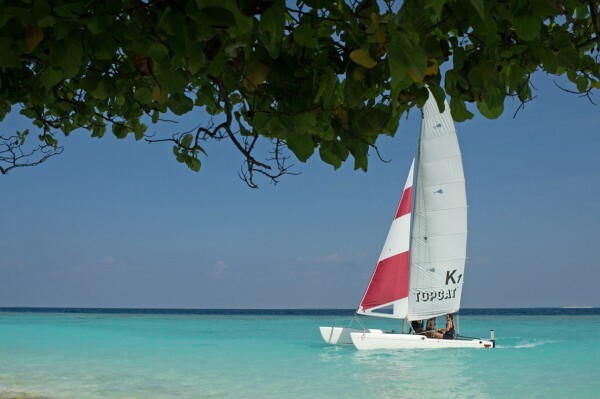 There are so many activities to enjoy at Soneva Fushi. We can offer cooking classes, fishing, water-sports, private chefs and much more. Guests can set sail on your own voyages of discovery to local deserted islands and experience the local villages. Enjoy endless views of the Indian Ocean while you sunbathe and snorkel on an uninhabited island. You can also enjoy endless fishing opportunities where you can even cook what you catch. You can also experience the local culture as you stroll the white sand lanes of a tiny village, then set out on a traditional wooden dhoni for a dolphin safari. The Maldives are a diver’s paradise and Soneva Fushi has the most breathtaking stretch for diving. The Baa Atoll was recently named a UNESCO Biosphere Reserve for its tremendously high biodiversity. The resort offers professional dive instructors that can guide you around more than 30 diving sites from June to November. Guests can also experience excellent Snorkelling at the home reef at Soneva Fushi. If you would like to venture further afield, our marine biologist will be happy to guide you to most unforgettable snorkelling spots of the Baa Atoll.